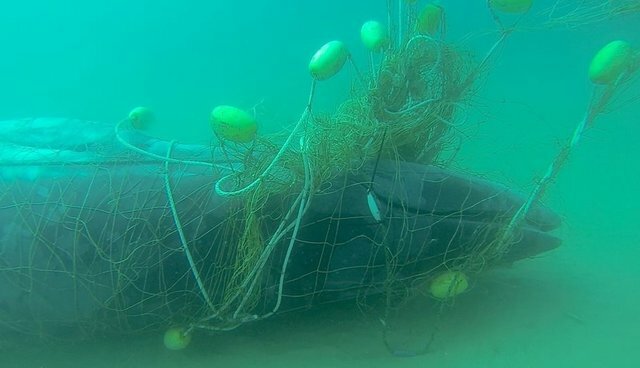 Upon reading comments made by Gold Coast Tourism CEO, Martin Winter regarding the use of shark nets throughout the whale migration, I decided to cancel my flight from Perth to the Gold Coast later this year. Fortunately, I was able to get a credit and will direct my tourism dollars elsewhere. You see, I don't want to visit the Gold Coast at the expense of a whale's life. My tourism dollar, which appears to be so precious to Mr. Winter, is not worth the hundreds of vulnerable and endangered marine species killed in these lethal traps every year. How very hypocritical we Australians can be. While our Government holds the Japanese account for whaling in the Southern Ocean, the same Government then permits these animals, often rescued by Sea Shepherd, to be killed on their return trip to Australia - within local beaches. And shark nets do not provide the security that many Australians believe they do. In fact, sharks can and do swim past these shark nets, around and underneath them, with the majority of sharks being caught on the shore-side of the net. Added to this, is a finding by marine scientist Jessica Meeuwig, which shows that shark control measures have made no difference to shark attack rates in Queensland. But that is not all. There are a range of non-lethal options that are not even being considered at the moment by Queensland authorities, despite petitions garnering over 34,500 signatures and numerous pleas by conservationists and scientists, pointing them out. In Western Australia, where the Environmental Protection Authority recently raised concerns regarding the environmental impacts of a drum line program one fifth the size of Queensland's, eco-friendly shark barriers are being installed along local beaches instead. The Eco Shark Barrier is very popular within the community, has recorded no by-catch and is great for creating artificial reefs, while also protecting beach goers. These barriers are very economical, could easily replace a shark net and offer complete protection. But alas! Despite knowing the sensitivity of the ecology and environment, Martin Winter would prefer the tourism dollar. Because tourists breaking into holiday destinations within the Gold Coast and stealing wildlife is great for the economy, right? Meanwhile, whales help to maintain a stable food chain and offset carbon in the atmosphere. Which gets me to my next point. Surely whales play an important role in attracting the tourism dollar? Whale watching has become a tourism booster across the globe, with billions of dollars being spent by people hoping to get a glance of these majestic creatures in their natural habitat, attracting tourists far and wide. It is without a doubt, whales are worth more alive then dead, and that is why, I won't be going to the Gold Coast. Last year, five whales died within shark nets in Queensland. I can not and will not support the thinking that tourists are worth more than the hundreds of marine animals that die within these nets yearly.